Is this speech free? Will my trial be fair? 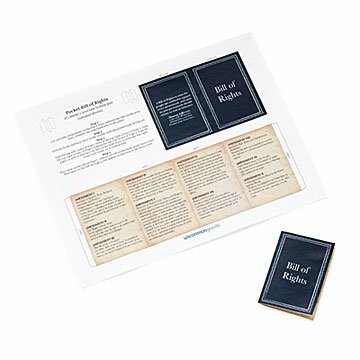 Always keep your individual liberties close and convenient with this portable-size Bill of Rights. The printable 2.5" x 3.5" booklet features the Constitution's first Ten Amendments designed to look like the original—minus the eighteenth century calligraphy. Place it in your pocket or wallet, or give them out as a playful, patriotic favor at your next party. Click here for your free download of the Printable Pocket Bill of Rights. PDFs formatted for 8.5" x 11" paper. Folded book is 2.5" x 3.5". Fantastic Resource for the Civil Libertarian! I have been looking for a Pocket Bill of Rights for years that I could give away on Bill of Rights Day. Thank you! Thank you! Thank you! This is PERFECT! Imagine a store that would give something away without expecting you to purchase something while you were there! My hat is off to Uncommon Goods. I've loved your company for numerous years. This is an awesome service! A free copy of the Bill of Rights. Perfection, Uncommon Goods! Cant wait to impress my friends with this cute little guy. It's such a great gesture offering this free. I'm sure most Americans don't even know what's in the Bill of Rights.